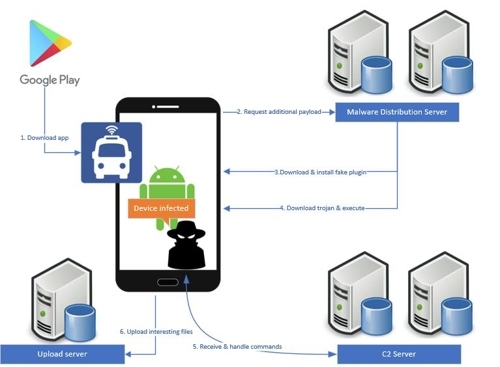 Malware that steals a user's personal information has been found on an Android application that provides information on buses that operate in South Korea's major cities. U.S.-based global computer security software company McAfee said Sunday that the malware was found on particular versions of four apps that contained information on buses in Daegu, Gwangju, Jeonju and Changwon. The malware locates files with certain keywords in smartphones, such as North Korea, the National Intelligence Service, Moon Jae-in and the National Assembly, then leaks them to an external server, suggesting possible North Korean involvement. McAfee said the malware is seemingly designed for targeted attacks to leak classified information on defense and politics. Hacking attempts, which North Korea is suspected of being behind, continue to be carried out, such as a recent mass delivery of e-mails containing malware to members of the press corps at the South Korean Unification Ministry.